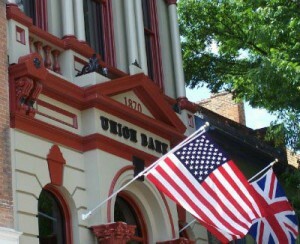 The Union Jack Pub & Restaurant is housed in the Victorian cast iron Union Bank Building which has been restored at it was originally in 1878, making it a true Historic Landmark of Winchester. The menu offers a host of authentic British dishes, including steak and kidney pie and a traditional Ploughman’s lunch. Cream Teas with sandwiches & scones also are offered The 50 ft. bar offers a huge selection of domestic and European beers, plus a large wine selection. The pub offers flat screen TVs for news, European soccer, & USA sports, while the second floor Cocktail Lounge is available for your comfort, when available & also by reservation. The 18 foot Top floor offers stage and sound system for Weekend live music venues. Both charming sections are also available for special event and business use. We have excellent selection & quality with affordable prices! Are you tired of “NOT” finding a true British & UK dining experience? Then come in to the Union Jack Pub! Hours of Operation: Open 7 days a week from 11am - 1 am. Lunch menu until 4 pm.